Blowout Sale! 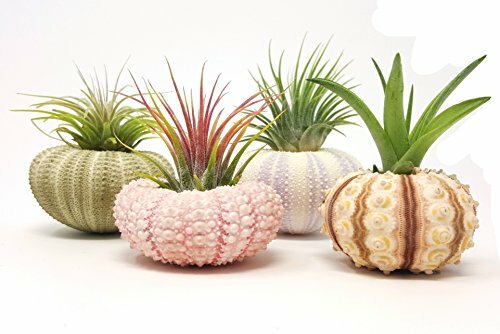 Save 51% on the Aura Creations 4 Pcs Sea Urchin Air Plant Lot/Kit Includes 4 Live Plants and 4 Sea Shells/Housewarming Home Decor Accents by Aura Creations at Tulips Orchids. Hurry! Limited time offer. Offer valid only while supplies last. Tillandsia Air Plant Sea Urchins from Aura Creations® These adorable creations are a lovey addition to any space, and make for the Perfect Gift! ► 4 Tillandsia Air Plants 1-3"
*Your Plants will ship FAST from one of our Greenhouses to you / NOT a fulfillment center or warehouse. **Note: Since these are natural specimens please expect some slight difference between each piece, and lot purchased. What's the best way to display them? Because they're so versatile, the possibilities are endless. A single suspended air plant is simple and beautiful, but they can also be arranged in any style and in any area. That's why it's so fun to design with air plants — they can bring nature to any space, indoors or out. EASY CARE - Air plants are very low maintenance. No need for soil and they only need water once a week. They will thrive virtually anywhere. POWERFUL AIR PURIFIERS - Tillandsias have the power to both filter and cleanse the air. Improve the quality of your air with living air plants while beautifying your space at the same time. MODERN HOME DÉCOR - From terrariums to home decor accents, air plants can be used to create truly unique art, crafts, and gifts for all occasions.